When a major news outlet, especially an obvious organ of the Democratic Party, publishes an article which unequivocally confirms that Barack Obama’s birth certificate copy filed at an official White House website, the dam surrounding this issue is about to break. How can such a high profile crime possibly be shielded from the appropriate federal and state investigative bodies and subsequent prosecutorial processes from this point forward? How can the 27 Republican State Attorneys General avoid their statutory responsibility to the citizens of their respective states? Especially during the run-up to a US presidential election and the most heavily scrutinized campaign season in memory? Is the Mainstream Media so complicit in this fraud being perpetrated on the nation, and so committed to protecting this unprecedented crime, that they can no longer function as an objective and fact-based press corp? The following questions have been submitted in the past, but are well worth restating at this critical juncture of this extremely consequential and weighty investigation. “Where is the National Press Corp? Where is the WashPo, NYT, WSJ, and USA Today? Based on black and white evidence published on a government website, a sitting president has given every appearance that federal laws have been broken, perhaps a number of felony crimes committed. In short the public trust and social contract have been violated in a quite profound and fundamental way. And, yet, the fourth estate (except the truly alternative media) is AWOL? The mainstream media is out to lunch? Just in case you haven’t seen the article at the Huffington Post, here’s the link. It is very important for the electorate to understand, prior to the 2012 election in November, that this investigation was originally undertaken at the request of Arizona citizens from all walks of life and every political persuasion. US Federal Law requires that every presidential candidate be properly qualified and vetted before they can be legally placed on a state ballot. In the interest of pursuing the facts surrounding Barack Obama’s fitness to run for president a second time, the Arizona investigators sought out the most relevant expertise and seasoned experience within the field of electronic document generation. In fact, the following has been recently posted in this regard at this website. Perhaps the most startling discovery to be made throughout the Cold Case Posse investigation concerns the State of Hawaii. It has been pointed out that acquiring a birth certificate in Hawaii is fairly easy to do, if one wanted to apply for a fraudulent document which could then be used to legitimize US citizenship. Certainly, if this was done in the case of Obama back in 1961, then it has been duplicated countless times since then. So serious is this defect in both law and procedure that one news outlet was recently compelled to post the following headline. It now seems inevitable that the USA will be plunged into a constitutional crisis of unparalleled proportions because of this unresolved matter. Whether Barack Obama is re-elected again or not, this profound and fundamental electoral crime will hang over his head, the Democratic Party, the entire Mainstream Media, as well as those throughout this nation who chose to ignore irrefutable evidence of a crime being committed in plain sight … by the highest office in the land! 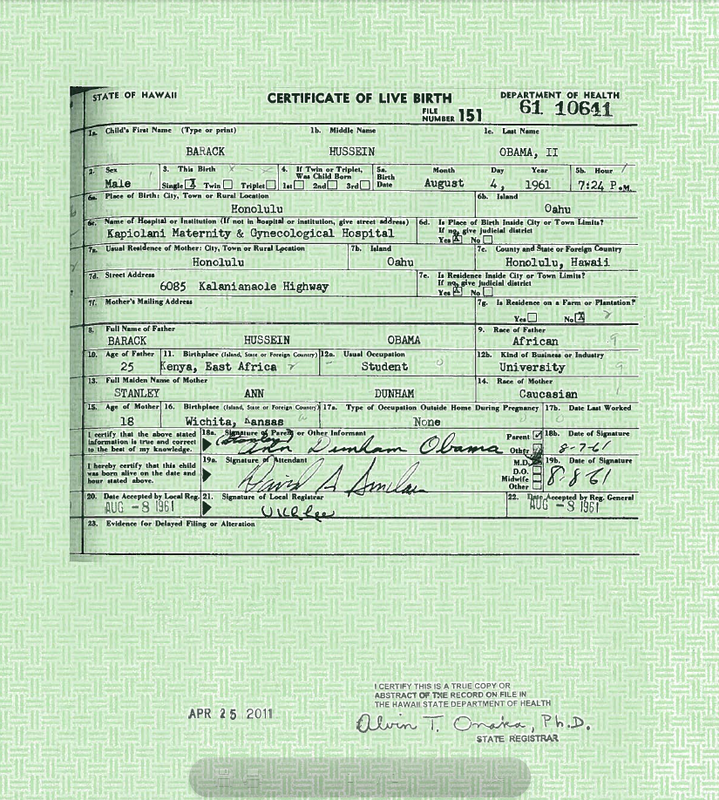 For those who are uninitiated in the area of authenticating birth certificates, please click on the following pdf for a close up view of the birth certificate copy currently posted on the official WhiteHouse.gov website. This enlarged version will reveal obvious anomalies even to the completely untrained eye or inexperienced researcher.